Autumn is upon us! It’s well past the mid-October mark, and if you live in the northern hemisphere, you’re probably enjoying a break from your typical summer heat. That’s the principle, anyway. It’s not been the case in Kansas the last couple days, but I have high hopes of a chilly weekend! When autumn hits, I like to at least think about the possibilities for fall-ish embroidery projects. And this is really a shame, because if it’s already autumn, by the time I get around to stitching something autumn-related, it’s usually winter. And the urge, by then, has passed. The little basket above is something I drummed up for an article for DMC, which will be published on Commonthread next week. It’ll include the pattern for the little basket of pumpkins, which, in fact, is a tad over 2″ wide. The point: when I do actually manage some seasonal embroidery, it’s generally small. It goes faster that way! And in this case, the little basket was embroidered while the searing heat of summer was still upon us. So now and then, I actually do manage to work in advance of the season… but only when pressed. Tree with Leaves – this is a free embroidery pattern that would work great in tambour embroidery or any kind of line stitching. It would be especially effective in variegated fall colors. Leafy Corner – Also a free pattern, which would work great with soutache braids or couched cord, but would also well (and quickly) in tambour embroidery or any line stitches. Another good one for some variegated fall colors. Be Ye Thankful – a free pattern that offers a good reminder. It’s a simple pattern. I doodled it up for my niece. She liked it! Blackwork Autumn Leaves – if you like blackwork and you like leaves, this is a corner pattern (and very easy to repeat) that would look nice on table linens. Turkey Embroidery Pattern – Well, he’s often center stage on the Thanksgiving table, but if you embroider him, he’ll last longer. Acorn & Leaf Border – Ages ago, I posted the tiny scanned version of this acorn and leaf border. Recently, I re-worked the pattern and turned it into a corner pattern (with a linear repeat, if you want to repeat), so that it would be more useful on kitchen and table linens. I also provided a cleaned up line drawing and a PDF printable. How to Embroider a Fall Tree – Part one covers embroidering the trunk and branches, and part two covers adding the foliage. The tree is worked in silk gimp and in silk wrapped purl, and it would be a neat addition to stumpwork pieces and similar embroidery projects. Are You a Seasonal Stitcher? Do you stitch seasonal projects? Do you wait until the season hits to actually start stitching them? Or do you plan ahead? Do your stitching preferences change with the seasons? Do you have any good tips on how to plan ahead (or how far ahead to plan!) for embellishing seasonal items? Feel free to chime in below with your thoughts on seasonal needlework! Since we don’t celebrate the holidays I’m not much of a seasonal stitcher. I’ll admire the work and colors, but it really does nothing for me. Mary, I must have missed it but how do you join Commonthread? I can’t seem to find it…..Thanks I love your work! Hi, Tara – you can find DIY stuff and tutorials on Commonthread here: http://commonthread.us/discover/category/diy-projects If you want to find my stuff specifically, search Mary Crobet in the search line. The pumpkin basket pattern won’t be posted until next Monday, due to schedule changes. I do plan ahead for Christmas theme, there is always so much you can do,with different colours, but my thread and needles are always always out and ready to jump into a project. Up until today, the weather in north Texas has been unseasonably warm. By this time of year, our high temperatures are usually in the low eighties, but although the mornings and nights have been cool-ish, we’ve had temperatures in the mid-nineties up until just the past couple of days. A cool front is teasing us with the possibility of rain and lower temps. As for seasonal stitching…the only thing I really schedule based on the time of year is hand quilting. I try to do as much of it as possible in late autumn and winter. Anything else I stitch is mainly based on “when it’s due.” Things like temari balls for the tree, Christmas stockings, and any stitchery gifty thingies get done waaaaaaaaaaay before the holiday. October is busy with Halloween costumes (this year, my grandson requested the Iron Giant, so we’ve been very busy with cardboard and grey duct tape and paint the past couple of weeks), so I get far less just-for-me-stitching done in this month. Okay, now I’m just rambling…thank you for the links! Oh, and by the way, I used your acorn and leaf border design for the border quilting on my MIL’s Thanksgiving table runner. It was perfect! When I was first embroidering (back in the dark ages), it was popular to have embroidered seasonal framed prints that you would switch out on your wall for each season/holiday. Sort of like people do now with yard flags. I always liked that idea, but never seemed to have a place big enough or just the right spot to do this. I have done some simple Christmas stuff, though. Thanks for sharing this, Mary! Hero! Thank you. I learn from you everyday!! Am I a seasonal stitcher? Sometimes yes, some times no. I think I am like you in that manner. However, I do love leaves and pumpkins. I have done many of each. Most of the leaves are done by needle painting; the pumpkins by cross stitch. Cross Stitch and Halloween combined thrills me to no end and with the first hint of fall, I must start a Halloween cross stitch piece. This year it is ‘Halloween Collage’ by Sharon Pope from Just CrossStitch 2014 Special Collector’s Issue. This is turning out very well- the colours are very vibrant. I am very much enjoying this. No, It will not be done for this Halloween. Maybe next. I am a seasonal stitcher – when I can remember to start early enough! Ha! I did manage a couple of pumpkin pillows this fall (mostly quilting, with a few hand-stitched details – kind of cheating on the fall embroidery part). I save lots of patterns and ideas (again, mostly for fall, my favorite season), but I seem to “collect” more ideas than I actually have time to stitch them. Can I be a seasonal dreamer?! Thank you for giving me permission to have more than one embroidery project going at one time. All in the name of Seasons! I have wanted to play with new ideas and felt I need to finish the one before a new. Variety is the spice of life in embroidery! 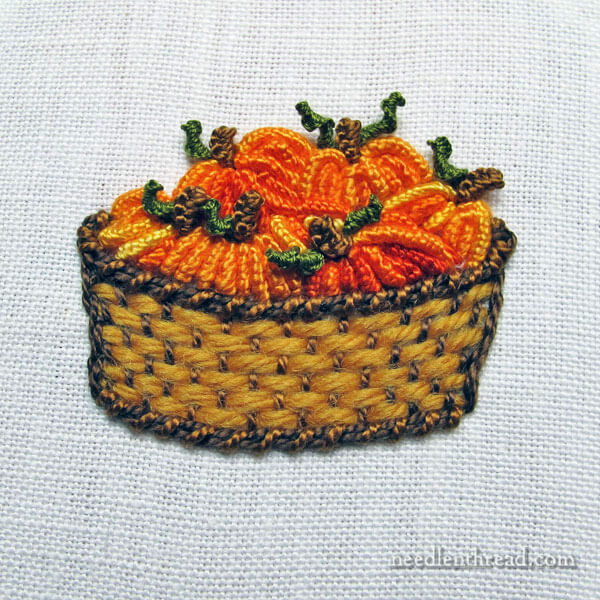 Pretty cute pumpkin basket…..i am sure there will be many of these gracing various linens come Thanksgiving day! I wanted to ask you(and actually have wantd to for some time) if you have ever considered lessons on how you use the various computer programs to clean up /work on your line drawings and patterns? Hope things go well for you in your upcoming medical stuff…..you are on a daily chant list. Hi Mary. I love your site and was just poking around your tutorials on the bullion stitch. The pumpkin pattern is adorable and looks like it will be a good opportunity for practice on that one. So yes, in this case I will be a seasonal stitcher. 🙂 Thank you so much for posting all the helpful tips. This site is truly a treasure trove for stitchers. I’ve just recently gotten back into embroidery after a long hiatus and am really enjoying it. Oh yes, my stitching reflects the seasons. I love having a project that matches the mood that goes with the time of year. It is another way of ‘celebrating’ the seasons. So much fun!! I can always tell when Christmas is coming – that’s when I start drooling over the Susan Roberts needlepoint stocking canvases. They’re absolutely gorgeous… and expensive. One of these days, I _will_ get the Santa on a Harley one… and Santa golfing, playing baseball, Cowboy Santa… hee. PS: I’ve been lurking and reading of your health worries. Big hug and hope you’re all better soon! I find myself avoiding seasonal projects as much as possible. Not only do I *hate* stitching to a deadline (I do enough of that in my non-stitching life), I’ve never been someone who’s organized enough to decorate with all my bits and bobs, or who wants to save them for the two weeks a year when I’m supposed to use them.